Last night at our Wednesday night gathering I illustrated a point by reading Bob Kauflin’s testimony on pp. 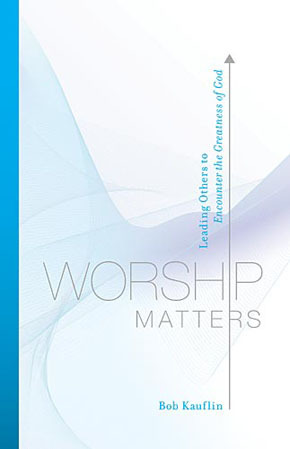 22-25 of his helpful book Worship Matters. Its a story I have been reflecting on for several days, and I keep seeing my sin and the gospel through it. If you haven’t read it, those 3 pages alone are worth the price of the book. Bob helps me examine my own heart for where I am battling the glory of God by seeking my own glory instead. Its one thing to say, “I am trusting in Jesus for my salvation and I want God to receive all the glory for my life.” But indwelling sin is no small thing which mere words and and neat mental concepts can defeat. It is another thing to look daily to Jesus for all things in the same posture of needy faith and die to all thoughts of self-concern and anything that detracts from the glory of God in my life. If I honestly ask, “do I care more about how I am viewed, or how God is viewed?” before every meeting, every conversation, every event I am able to see various ways in which the roots of pride and idolatry have not been dug up from my heart. Trusting in Jesus is a lifelong battle that begins afresh every day. God’s mercies are new every morning: therefore so is my need to receive them by faith every morning. What I am seeing is that the same posture of faith in which we empty ourselves of our own contributions and trust completely in Jesus for salvation – that same posture of faith is the key to following Christ each day. Each moment of genuine sanctification mirrors that initial moment of justification: total surrender to and trust in Christ. In order to be initially saved, I must bow before the cross. And in order to live one moment as a Christian, I must bow before the cross. Jesus + nothing is the formula for salvation, for ministry, for my marriage, for everything. That way He gets all the glory. I have not had the pleasure of meeting you or your wife yet, but I will. I was at a meeting tonight with Laura Tapia, the group that are responsible for making sure all the little munchkins get to where they are supposed to be feeling loved and happy to be at God’s house. Laura mentioned your blog, so when I got home looked it up.Your quote from the book, do I care more about how I am viewed or how God is viewed, that is something I will try and engrave on my heart. Thank you and welcome to SMCC.